On my way out of Aberdeen Centre after a meal at Saboten (where I was still hungry...), I wanted to hit up Saint Germain for some pastries. I was walking towards H-Mart when some beef jerky caught my attention. No really, it really was beef jerky (for those who thought this was some inappropriate joke). We're not talking about he prepackaged stuff found at T&T, rather, it was the fresh stuff. Similar to Bee Kim Heng out in Vancouver, Mei Jan Hong in Aberdeen prepares freshly-made Singaporean beef jerky. 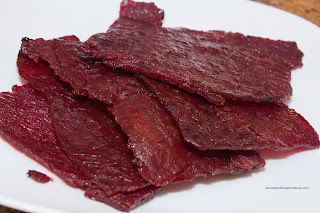 For those who are unfamiliar with this style of beef "jerky", it is sweeter and generally more moist than the stuff you see at Costco. 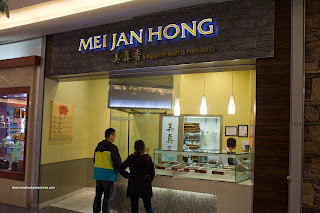 Furthermore, the ones you find at Bee Kim Heng and Mei Jan Hong are grilled. Think along the same lines at candied salmon (speaking of which, they have salmon jerky here too). This time I only stuck to the basics and got a pound each of the Beef and Pork Jerky. I also got them in 2 different textures as well - firm and soft. Furthermore, you can choose the spice level too. One last option is to either have them as ready-to-eat or vacuum-packed for extended shelf life. The first thing I noticed was the smaller amounts of charring on the meat compared to Bee Kim Heng. For me, that goes a long way adding more caramelization and smokiness to the meat. 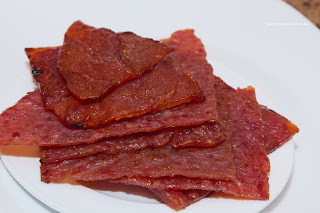 With that being said, the jerky was still quite good. Naturally, it was more sweet than savoury, yet it still had those elements as well. I actually preferred the spicy firm version since it had more texture and different flavour notes. The soft jerky is good too, I just find it sweeter (probably due to the higher moisture content). Not sure why they have such a low rating on Urbanspoon though. I thought it was pretty solid stuff.